Occlusion is well developed in Scalenodon, a diademodontid from the Middle Triassic of Tanzania. Such occlusion is seen also in traversodontids, tritylodonts and mammals, but is otherwise absent among eucynodonts. The jaw cycle ends with a pronounced backwards pull of the lower jaw, and a powerful shearing and crushing movement is initiated in which all seven lower cheek teeth move tightly back into curved facets of the broad upper cheek teeth (see illustration). Food items are sheared by a double cutting system, between the raised transverse ridges of lower and upper teeth, and between longitudinal ridges on the external side of both sets of teeth. Finally, as the backwards movement ends, the main faces of both teeth nearly meet and any food particle caught between would be crushed effectively. Read more about cynodonts at http://faculty.uca.edu/~benw/ biol4402/lecture13/ and http://www.palaeos.com/Vertebrates/ Units/410Cynodontia/410.000.html. lum in Probelesodon and later cynodonts was deeper than in Thrinaxodon, and the articulating head of the femur was bent more inwards. This mammalian posture seems to have arisen with Cynognathus and Diademodon, and it is a characteristic ofmammals and, independently, of derived archosaurs, dinosaurs and birds (see pp. 143-4). These cynodonts have been compared to a wheelbarrow, where the hindlimbs stride along in an erect posture and the more sprawling forelimbs are forced to move rapidly to keep ahead. Probainognathus from the same beds as Probelesodon, the next stage in cynodont evolution (Figure 10.1), has a low zygomatic arch, additional cusps on the cheek teeth and a second jaw joint. 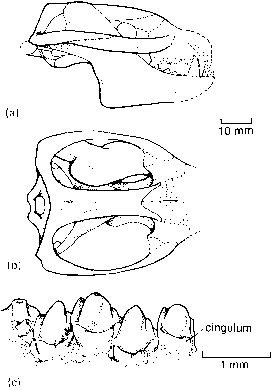 Incredible as it may seem, Probainognathus and some other advanced cynodonts have a double jaw joint (see Box 10.2). Other characters of Probainognathus and subsequent cynodonts relate to modifications in the development of the brain. The traversodontids, known particularly from the Middle and Upper Triassic of South America, as well as from southern Africa, Madagascar, India, North Amer ica and Europe (Abdala and Ribeiro, 2003), appear to fall next in the cladogram (Figure 10.1). This was the most successful group of herbivorous cynodonts, and forms such as Massetognathus and Scalenodon from the Middle Triassic of South America (Figure 10.2(g) and Box 10.1) were present in vast numbers, foraging for tough vegetation at the feet of the large dicynodonts, and preyed on by chiniquodontids such as Probele-sodon.The traversodontids show further modifications to the bones around the brain and to the back of the lower jaw, where certain elements were moving from functions in jaw articulation to improving the acoustic function (see Box 10.2). In the skeleton (Figure 10.2(g)), Massetognathus has an erect mammalian hindlimb and sprawling reptilian forelimb, as in Probelesodon (Figure 10.2(f)), and the lumbar ribs are reduced (such ribs are absent in mammals). The reduction and loss of lumbar ribs probably indicate the evolution of a diaphragm in these forms. In modern mammals, the diaphragm is a tough sheet of muscle that separates the chest region from the abdomen and improves breathing efficiency. One of the most spectacular evolutionary transitions is the modification of the 'reptilian' jaw joint of basal cynodonts into two of the three inner ear ossicles of mammals. 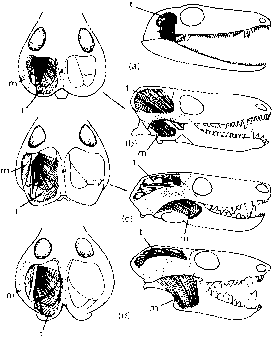 The jaw joint in Thrinaxodon (illustration I(a, c)) is between the quadrate and articular, but the quadrate is much reduced. The surangular, just behind the coronoid process of the dentary, comes very close to the squamosal, and the stapes touches the quadrate, as in more basal synapsids. A few subtle changes in Probainognathus (illustration I(d)) mark the beginnings of the switch. The surangular now meets the squamosal in a special hollowed facet, the glenoid, which allowed rocking movements. The articular forms part of a narrow rod (including the reduced angular, prearticular and surangular), which is loosely held in a groove on the inside of the dentary. By this stage the 'reptilian' jaw joint, and a new joint, are both present, very close together, and apparently functioning in tandem. The next stage is seen in the mammal Morganucodon (illustration I(b, e)), in which the dentary contacts the squamosal. The surangular loses contact with the squamosal and is replaced by a distinctive enlarged process of the dentary that fits into the glenoid on the squamosal. In typical reptiles and birds, the eardrum, or tympanum, is a circular sheet of skin held taut in the curve behind the quadrate. Sound is transmitted to the inner ear within the braincase in the form of vibrations by the stapes, a rod of bone extending from the tympanum to the inner ear (illustration II(a)). 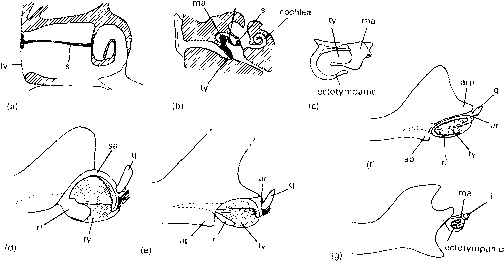 In modern mammals, sound is transmitted via a set of three tiny bones within the middle ear, the auditory ossicles: the malleus, incus and stapes, or hammer, anvil and stirrup (illustration II(b)). The tympanum is held taut by the curved ectotympanic, which sits just behind the squamosal-dentary jaw joint (illustration II(c)). The mammalian stapes is the same as the reptilian stapes, the malleus is the reptilian articular and prearticular, the incus the quadrate and the ectotympanic the angular. The reptilian jaw joint is present within our middle ear, and the close association explains why we can still hear our jaw movements when we chew. The evolution of the cynodont and mammalian jaw joint and middle ear has been reconstructed as a four-stage process by Allin (1975). He assumes that the angular, articular and quadrate bones were already involved in sound conduction in therap-sids (illustration II(d, e)). He restores a large tympanic membrane beneath the dentary, held taut by the reflected lamina of the angular below and the surangular above. Vibrations of the tympanum passed through the articular and quadrate to the stapes. In other words, he regards the lower jaw as a key part of the hearing equipment of early cynodonts. The tympanum became smaller and was pushed behind the new squamosal-dentary jaw joint in early mammals (illustration II(f, g)). At the same time, the articular-quadrate crank became reduced and separated from the rest of the skull and lower jaw, and moved fully into a separate auditory passage. mals, the internal and posterior adductors are much reduced and the key jaw muscles (Figure 10.3(b)) are a deep temporalis muscle,derived from the reptilian external adductor, and a more superficial masseter mus-cle,new to mammals. In more advanced cynodonts (Figure 10.3(c)), the volume of adductor muscles is greater, as shown by the extensive outwards bowing of the zygomatic arch. The shift in jaw articulation and the rearrangement of jaw muscles that began in the cynodonts paved the way for an important advance in their mammalian descendants, namely chewing. Mammals are able to move their jaws through a triangular orbit of motion, with chewing on each side of the mouth in turn, and these actions are essential for the complex grinding activities of the cheek teeth. The strikingly mammalian jaw muscles and cheek teeth of cynodonts were associated with another major evolutionary step, a reduction in the number of cycles of tooth replacement. In reptiles and other vertebrates, teeth are replaced more or less continuously as the animal grows older, or as the old ones wear out. In mammals, on the other hand, there is only one replacement, when the milk teeth of the juvenile give way to the adult set. This reduced dental replacement was essential for the development of cheek tooth occlusion. The final cynodont evolutionary stages were reached by the tritylodonts and tritheledonts (see p. 30). In reptiles, the jaw joint is between the quadrate at the back of the skull and the articular at the back of the lower jaw. In modern mammals, the jaw hinges on a new joint between the squamosal and the dentary. Fossil intermediates show how the transition happened: two reptilian jaw bones shifted into the middle ear. At the same time, a new process arose from the rear of the dentary that formed a contact with the squamosal, and this eventually became the sole jaw joint (see Box 10.2). The migration of these small bones from the jaw to the ear might have been linked to expansion of the brain in mammals, a process that forced the ossicles from their former lateral position and pushed them back beneath the braincase. Two cynodont clades, the tritylodonts and tritheledonts, appear to be close to mammals, but they do not show the full transition to a squamosal—dentary jaw joint. It is still unclear which group is sister group to mammals: Kemp (1983) and Rowe (1993) argued for the tritylodonts, whereas Hopson and Kitching (2001) and Luo etal. (2002) found that trithelodonts fell in that position (Figure 10.1). The tritylodonts, represented by 12 genera from the Upper Triassic to Lower Cretaceous of most parts of the world (Kühne, 1956; Sues, 1986), were highly successful herbivores that ranged in skull length from 40 to 220 mm. Kayentatherium from North America (Sues, 1986) has the typical rodent-like tritylodont skull (Figure 10.4(a—c)) with a deep lower jaw, deep zygomatic arch and high sagittal crest, indicating powerful jaw muscles and a highly specialized dentition. There are elongate incisors and six to eight massive cheek teeth in straight rows. 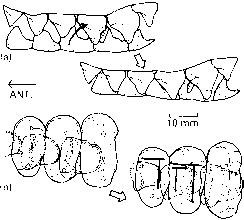 The upper cheek teeth of Oligokyphus from the Lower Jurassic of Wales all bear three longitudinal rows of crescent-shaped cusps, whereas the lower teeth bear two rows (Figure 10.4(d, e)). When the jaws close, the lower teeth move back and the crescent-shaped cusps are drawn across the food, tearing it up along four parallel grating surfaces (Figure 10.4(f)). Oligokyphus (Figure 10.4(g)) has a long body and short limbs. The tritylodonts have often been allied with the other herbivorous cynodonts as 'gomphodonts' because of their occluding broad cheek teeth with parallel rows of cusps (Hopson and Kitching, 2001). Trity-lodonts and mammals share numerous characters, however, including a complete orbital wall, a stapedial process on the quadrate and an anteriorly inclined ilium (Kemp, 1982; Rowe, 1988,1993). poorly-known group of small animals that are mammal-like in many respects (Kemp, 1982; Hopson and Barghusen, 1986; Rowe, 1993). 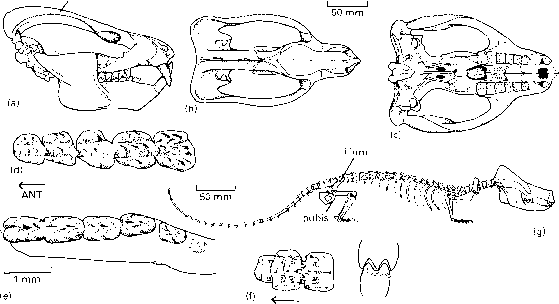 Three genera are known from fragmentary skulls from the Upper Triassic and Lower Jurassic of South Africa and South America, and these show a number of mammalian characters (Figure 10.5(a-c)) such as the loss of the postorbital bar between the orbit and the temporal fenestra, a slender zygomatic arch, enlargement of the nasal cavity, the formation of a bony wall between the eyeballs and an external cingulum, or ridge, on the upper cheek teeth. The jaw joint in tritheledontids was almost entirely between the dentary and squamosal. The postdentary bones were reduced to a thin rod and this helped to transmit sound to the inner ear. The jaws were modified for extensive chewing by sideways and back-and-forwards movements. In reptiles, the lower jaws are firmly fused at the front, at the symphysis, but in tritheledonts and mammals the two jaws are unfused and mobile—held together merely by connective tissue. This allowed each lower jaw to rotate independently during chewing. 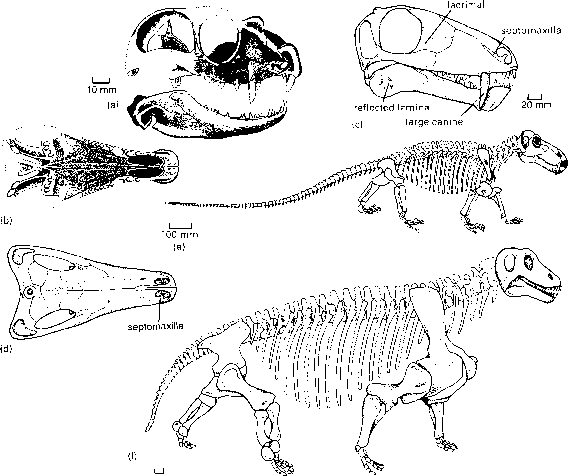 The skeleton oftritheledonts shows many mammallike features (Rowe, 1993). The vertebrae of the neck were short and mobile, and the dorsal vertebrae were quite distinct from the lumbar vertebrae. The ilium was reduced to a rod-like blade, as is typical of mammals (Figure 10.5(a)). The shoulder and hip girdles were further modified to allow the limbs to make a wide range of movements. All of these changes suggest that the tritheledonts moved like mammals, flexing the backbone up and down to lengthen the stride. In addition, mammals time their breathing to correspond to strides, so that they breathe in when the backbone is at full stretch, and out when the limbs come together below and the backbone arches. Tritheledonts may have been the first to achieve this adaptation, essential in animals with high metabolic rates (endotherms) and a need to pump oxygen rapidly.